China’s biggest holiday of the year, Chinese New Year (Monday 4th – Sunday 10th February) is just around the corner, and many Chinese tourists will take the week-long break as an opportunity to travel abroad with friends and family. According to Ctrip, over 400 million Chinese people will travel during the holiday, and 7 million of them will travel abroad. The OTA estimates that, during the holiday, Chinese outbound tourists will travel to over 900 destinations in 96 countries worldwide. Popular non-Asian destinations this year include Australia, Italy, the UAE, New Zealand, the UK, and Spain. Our Travel Trade Manager, Maria Wang, was asked by one of our clients to compile some information for her young daughter about how Chinese people celebrate Chinese New Year. Maria’s response was so sweet and insightful that we thought we would share it here. All Chinese students enjoy the Spring Festival as part of their winter vacation, which lasts approximately one month, usually from the middle of January to mid-February. Students in colleges enjoy a longer vacation than others, who stay out of school for, on average, almost a month and a half. The Spring Festival is the most important festival in China; it marks the beginning of a new year in the China Lunar Calendar, which has about a one month gap with the regular calendar. 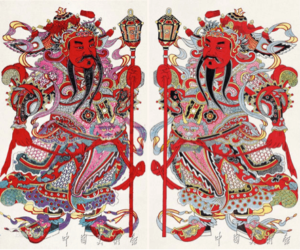 It also means the coming of the next Zodiac sign, which consists of 11 different animals and a dragon. For instance, right now we are in the year of dog, after the spring festival of 2019, we’ll be in the year of the pig. The image below shows the animals and their respective Zodiac sign. 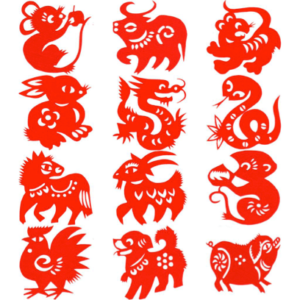 They are: Mouse/ 鼠(Shǔ), Ox / 牛(Niú), Tiger/ 虎(Hǔ), Rabbit/ 兔(Tù), Dragon/ 龙(Lónɡ), Snake / 蛇(Shé), Horse/ 马(Mǎ), Sheep/羊(Yánɡ), Monkey/ 猴(Hóu), Rooster / 鸡(Jī), Dog / 狗(Gǒu), and Pig / 猪(Zhū). There are various traditions in the celebration of the Spring Festival. Different areas and religions have different traditions, even several traditions have been introduced in the last decade or century. I can describe several traditions we have in Beijing at the moment. Some of us, especially the elderly, start their celebrations from the 23rd day of December in Lunar calendar. We call this day “小年” (xiǎo nián), which means “little year”. From this day to Chinese New Year’s Eve, we make different preparations for the celebration every day, including cleaning rooms, make stew, etc. One of them is to change a New Year picture (年画nián huà). We patch this on the door to ward the house from evil things. We put this on the window, which means 年年有余(nián nián yǒu yú). 有means ‘to have’, 余means ‘abundance’ or ‘prosperity’. It is pronounced similarly to 鱼(fish). The image below says ‘may you have more prosperity year after year’. At Chinese New Year’s Eve, almost all the family enjoy a family time together; this is what we call “大年”(dà nián), meaning “big year”. 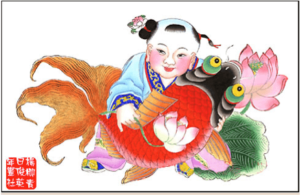 YEAR, in the Chinese character (年nián) is actually a monster in Chinese myth, and the celebration of the Spring Festival is also called “pass(过) the year (年)”. The family stay together to enjoy food and watch TV until the eve of 12 o’clock, which means we have successfully defeated the monster. At midnight, we would eat Chinese dumplings together too. If you can speak Chinese, you will understand the obvious reason. Dumplings (饺子jiǎo zi) has the similar pronounciation and tone as Jiaozi (交子jiāo zǐ), which is the time of midnight we used in the past. Red envelope (红包hóng bāo) is another tradition in the Spring Festival, whereby the elderly usually give their children and grandchildren red envelopes with money in. We call the money 压岁钱(yā suì qián), 压means press, 岁means age, and 钱means money, and you can see this from its literal meaning that giving money is a kind of wish. In the past, the younger generation gave red envelopes with money to their parents and grandparents, so as to press the age from growing older. Nobody knows when this tradition reversed. 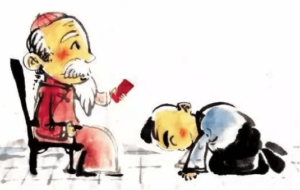 Before giving the red envelope, the young generation need to kowtow to the elderly, and say something wishful. We call it 磕头(kē tóu) – the word “kowtow” may come from it. For adults, the Spring Festival lasts 7 days, from Chinese New Year’s Eve to the 6th day of January of the Lunar calendar. We could go visit for Temple Fairs (庙会miào huì) which are held across different parks, to enjoy food and play games. We could celebrate this festival until the 15th day as traditions say. We call this day 正月十五 (zhēng yuè shíwǔ) – 正月(zhēng yuè) means the first year in the Lunar calendar, and十五(shíwǔ) means 15. The northern part of China has the tradition to eat 元宵(yuán xiāo), and the southerners eat 汤圆(tāng yuán).